Happy Life Affiliates provides no information on its website about who owns or runs the business. The “contact info” section of the website however details Charis Papadopoulos, who is credited as an “Internet MI Marketer”. Papadopolous (right) also features in numerous videos on the official Happy Life Affiliates website. On his Facebook page Papadopoulos confirms he is the owner of Happy Life Affiliates. Papadopolous resides in Thessaloníki, Greece, which is presumably also from where Happy Life Affiliates is operated from. Possibly due to language barriers, I was unable to put together Papadopolous’ MLM history prior to Happy Life Affiliates. 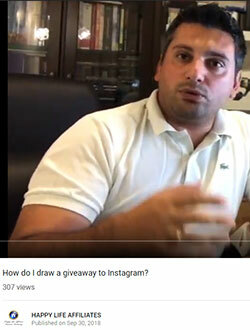 The Happy Life Affiliates YouTube channel suggests Papadopolous is heavily into online marketing. Read on for a full review of the Happy Life Affiliates MLM opportunity. Happy Life Affiliates has no retailable products or services, with affiliates only able to market Happy Life Affiliates affiliate membership itself. Note that once a “main program” has been selected, other services are offered to Happy Life Affiliates at a discount. Happy Life Affiliates’ compensation plan sees affiliates pay up to $28 a month for matrix positions. Commissions are paid when they recruit others who do the same. Note that an Automated Webinar “pay plan” is mentioned but no specifics are provided. I also couldn’t find any information on the Olympic Idea compensation plan. Given the compensation plans I was able to verify are 3×8 matrix based, it is assumed both Olympic Idea (might have been renamed to Our Global Idea) and Automated Webinar also use 3×8 matrix compensation plans. Access to the Olympic Marketing System is $28 a month. Happy Life Affiliates are paid to recruit new affiliates who pay for Olympic Marketing System access. No commission is paid out on an affiliate’s first three recruits, however the company does waive the $28 Olympic Marketing System monthly fee. The monthly $28 fee continues to be waived as long as the affiliate maintains at least three active Happy Life Affiliates paying for access to the Olympic Marketing System. From the third Olympic Marketing System recruit, a Happy Life Affiliate is paid $7 a month per affiliate recruited. Residual Olympic Marketing System commissions are paid via a 3×8 matrix. A 3×8 matrix places a Happy Life Affiliates affiliate at the top of a matrix, with three positions directly under them. These three positions form the first level of the matrix. The second level of the matrix is generated by splitting these first three positions into another three positions each. Levels three to eight of the matrix are generated in the same manner, with each new level housing three times as many positions as the previous level. Residual commissions are paid when positions in the matrix are filled. Positions in the matrix are filled via direct and indirect recruitment of affiliates who subscribe to the Olympic Marketing System. Happy Life Affiliates don’t disclose the commission paid per matrix position filled, but do state filling all 9840 positions in the 3×8 matrix pays $3279 a month. A Matching Bonus is also available, paying up to 50% of residual matrix commissions earned by personally recruited affiliates. Specific percentages aren’t provided, however the Olympic Marketing System does tie the Matching Bonus percentage paid out to personal recruitment. Also tied to recruitment is a Leadership Bonus, which pays up to $3 per affiliate recruited into a downline (unilevel, unlimited depth capped at ranked affiliates). Note that Olympic Marketing System affiliate rank criteria is not provided. My Online Coach membership is $28 a month. Happy Life Affiliates are paid $7 from the third affiliate they recruit who subscribes to the service. A $1 residual commission is paid per position filled in the My Online Coach matrix. As with the Olympic Marketing System, a Matching Bonus of up to 50% and Leadership Bonuses are also available (see Olympic Marketing System breakdown above). My Online Coach marketing mentions an additional Lifetime Car Bonus Program, but fails to provide any specifics. Happy Life Affiliates membership is free. Participation in the attached MLM opportunity however costs at least $28 a month or $336 annually. Multiple compensation positions are offered at a discount, with each attached to a Happy Life Affiliates service. Happy Life Affiliates is a sprawling mess of an MLM opportunity. Which is concerning, seeing as the company’s emphasis is on marketing tools. That Happy Life Affiliates itself can’t market itself effectively, is likely a reflection of the tools it bundles with affiliate matrix positions. With respect to the compensation plan, Happy Life Affiliates is your classic marketing tools pyramid scheme. That is the tools exist to promote the opportunity, which pays on recruitment. This business model renders whatever is bundled to fees charged redundant, as it’s recruitment that is paid out on. Retail doesn’t seem possible within Happy Life Affiliates, which kills any argument made as to the “value” of bundled services. As with all recruitment-based MLM opportunities, commissions in Happy Life Affiliates are tied to recruitment. Once recruitment inevitably slows down, those at the bottom of the company-wide matrix will be unable to recover their $28 monthly spend. They stop paying, which then means those above them stop getting paid. This effect slowly trickles up the company-wide matrix, eventually triggering an irreversible collapse. The Happy Life Affiliates’ website Alexa ranking isn’t looking too healthy, so there’s a good chance this might have already happened.